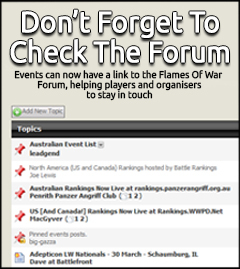 Flames of War v4 Mid-War 109 points Entry Fee: $25 (Prize Support) https://www.eventbrite.co.nz/e/muletown-spring-offensive-flames-of-war-tickets-55782523028 Players: 10 min and 18 max Location: Henry Horton State Park 4209 nashville hwy Chapel Hill TN, 37034 All Mid-War books are allowed Army lists need to be submitted by 3/30 [email protected] We will start with Red v Blue then use swiss-system … Continue reading "Muletown Spring Offensive (US) FoW MW 109 pts, April 6th @ Chapel Hill, TN"
Mid War Flames of War Tournament Points: Round 1: 105 Round 2: 95 Round 3: 85 Your force must maintain the same FORMATION(S) throughout the event. You can alter your formation and support. 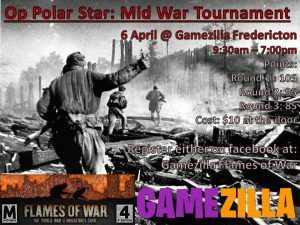 Cost $10 Schedule: Registration: 0930 Round 1 1000-1200 Lunch 1200 -1300 Round 2 1300-1500 Round 3 1530- 1730 Awards / Cleanup 1800 … Continue reading "Op Polar Star"
Battlefront Miniatures will located on stand TK010, we will be taking the full range of Great War and release of Oil War. 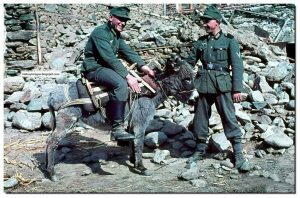 We will also have the full range of Mid War and Team Yankee. 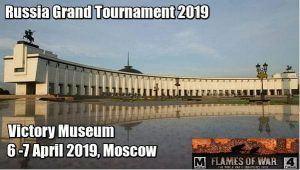 Come play on 4 demo tables featuring Take the Bath House- Great War, Modern Tanks Royal Rumble, Team Yankee, Oil … Continue reading "Salute 2019"
Location & Date: Saturday 4th of April, 2019 Feestzaal De Kei Adress: Keistraat 22 3590 Diepenbeek Belgium Free parking available in front of the building. Tournament structure: Every participant is guaranteed to play 3 games. During the tournament, a swiss system will be used. Blue on blue games are avoided as much as possible. 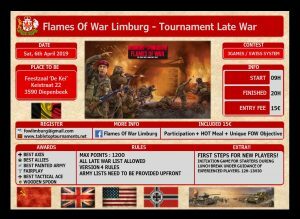 Missions: … Continue reading "Flames of War Limburg Tournament Late War"